Hey happy New Year to all of you..
We certainly have had a great Christmas & new year with lots of friends & family around. Maddies pups were centre of attention and all the dogs slept very well at night after their active days!!! Charlie & Jasper have produced 8 beautiful babies. 6 red- 4 boys & 2 girls & 2 black & white girls. 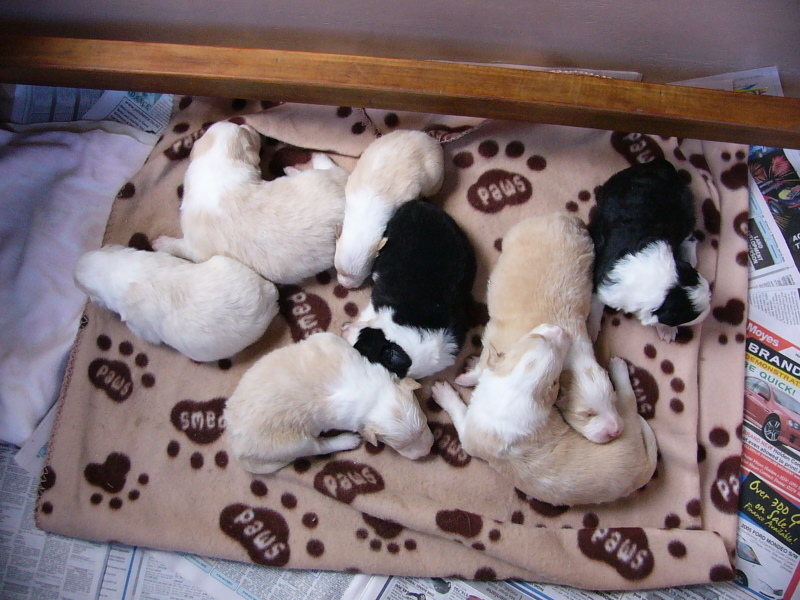 ( Pups available..) She had an excellent birth after a rather shaky start to the day!!!! Charlie’s last litter came early so we were on hot alert for days watching her. On the Saturday night Greg stayed up with her as she was so restless so we assumed they would arrive. I took over from him early Sunday morning & took her outside & let her off the lead… BAD MISTAKE.. I lost her.. Called & called & no sign. I went back inside & gingerly called Greg who had done such a good job minding her for the last 2 days.. so you can imagine his reaction ( well you would if you knew him!!) Anyway he did manage to find a hole & sure enough there she was… a good metre & a half buried in it & there was NO WAY she was coming out. After some time of coaxing her, she started digging again & filling in her entrance & I think it was at that stage I realised I really had to get down that awful.. dark.. spider infested hole myself.. move over McGyver… Oh My God.. Yes. So anyway I spotted her little face looking at me so assumed those naughty paws would be underneath & after some huge struggle I managed to get down that hole(NEVER AGAIN) only my knees out.. & grabbed her paw… I pulled her out crying & biting…. but I did manage to get her out. 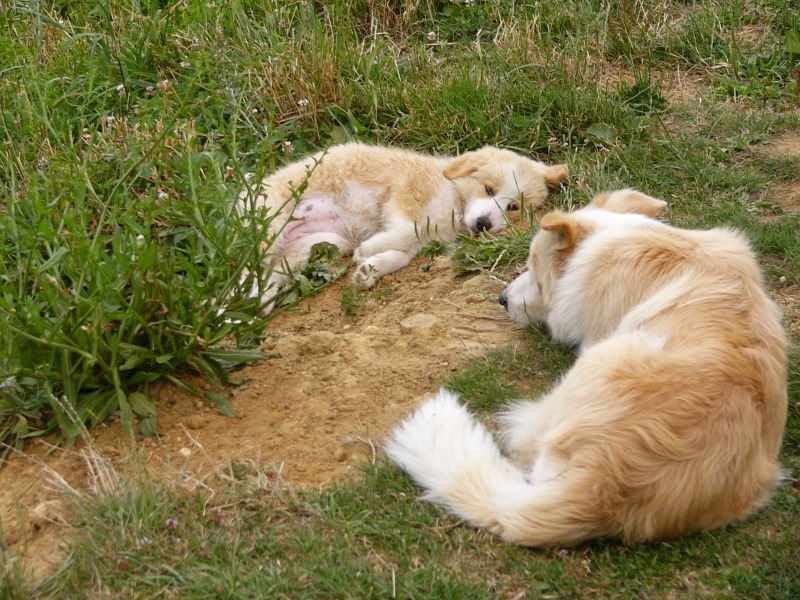 I had dirt in my nose, ears, hair, mouth & yuk it was just awful…… No more than 5 hours later she had her pups. If you had been in Katikati at the time you probably heard the pounding was.. yep I knew I was alive.. the adrenalin had a good work out that morning!! 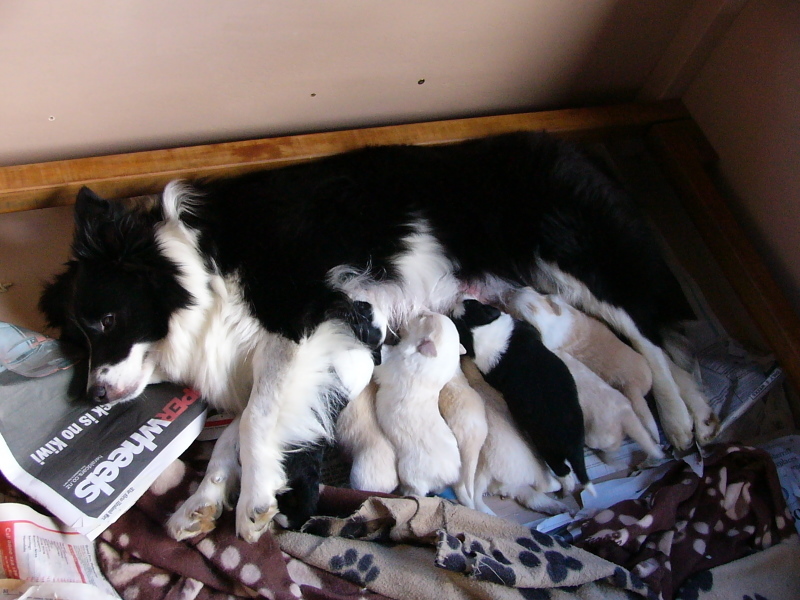 Anyway she did have a very good birth to 8 healthy babes, one very small baby but the rest a good size. We spent the first week making sure the wee one got in first & it has certainly paid off. I am just relieved we have them inside in a nice warm box & not in a den where I can’t see or even know what she had!! Gosh that is such a scary thought but its amazing how nature works. The w/e of the 16th at only 6 days old we had to go to my nephews wedding so I will say also a big thanks to my wonderful baby sitters Anne, Kaela & Lesley for looking after things so well. They continued with the 24 hour watch over the babes as Charlie wasn’t so keen to be in there with them & we appreciate their care. Thanks heaps Guys..You may need a little tuition with txting!!!! We did have a wonderful w/e away catching up with family for the big occassion & also on a walk from Whakatane to Ohope I was able to get in the water with the wonderful Moko dolphin. We were throwing seaweed & he would bring it back on his nose & although so big he was so gentle.. So Maddies pups quietly left the home nest over Xmas. 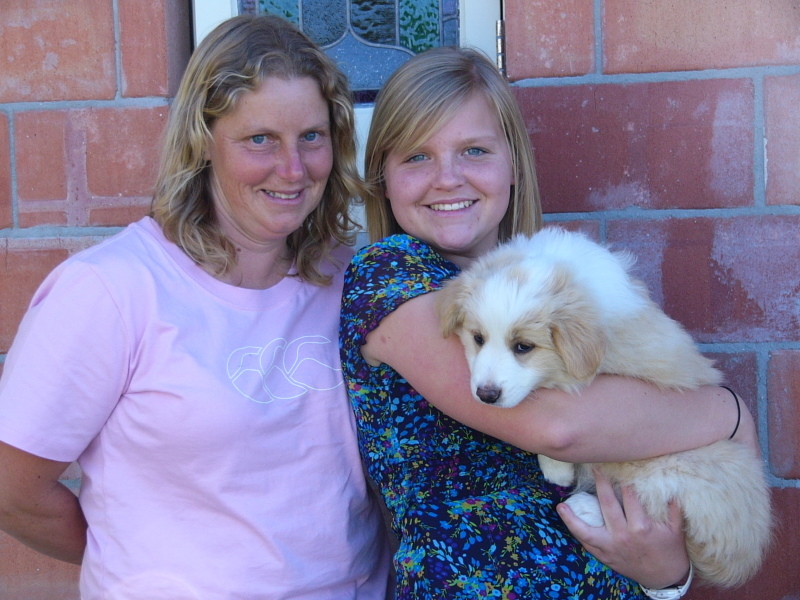 First was Julie & daughter Rebecca who came & took the big red boy they named Snoopy Dog. They have another border at home so will be kept well entertained. Apparently he is already very obedient & teaching the older Border a thing or two.. Go Tylerwild!!! Things may change as he gets into his adolescence -be warned guys!! Then Ray & Janet took Kaylee. 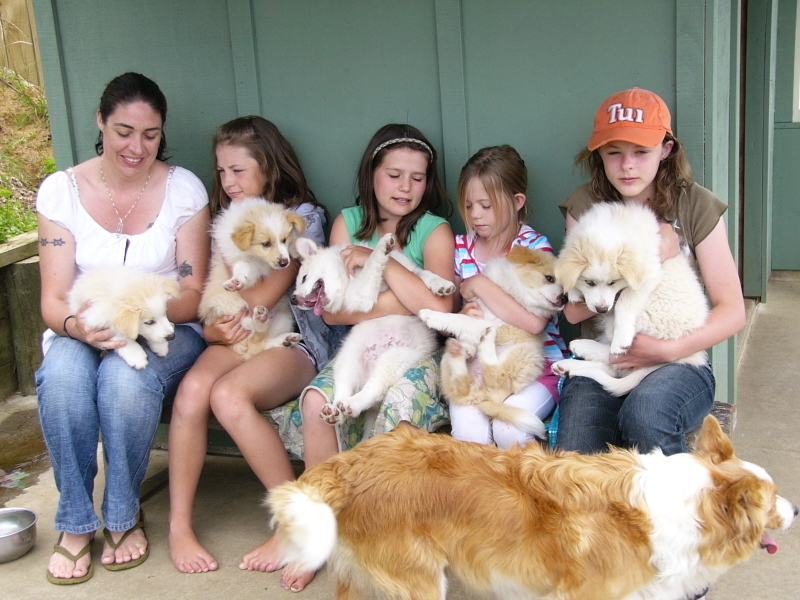 Their young granddaughter Tyler has been a visitor here a few times & its nice to know families where the pups go. Kaylee I think is very lucky as she only spent a couple of weeks at her new home & then went on tour!!! 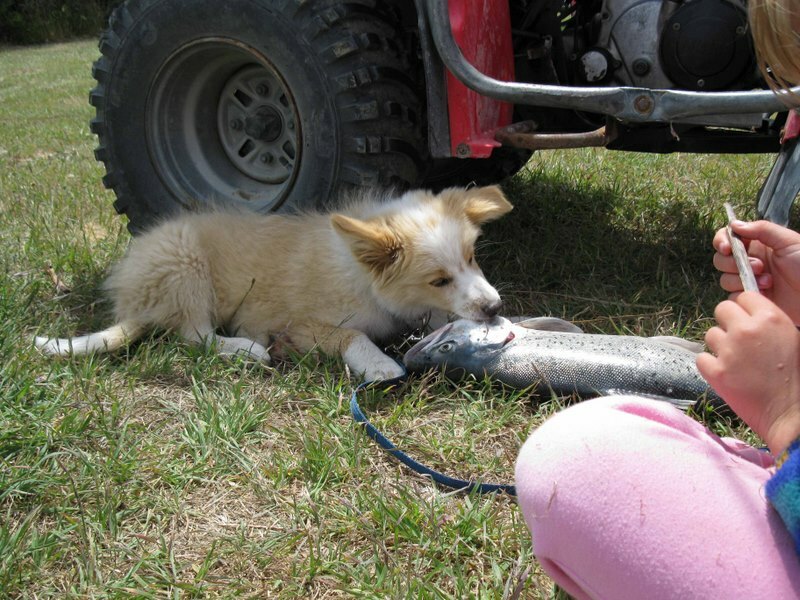 The last photo they sent was her checking out Ray’s catch down South!!! How good is that!!! 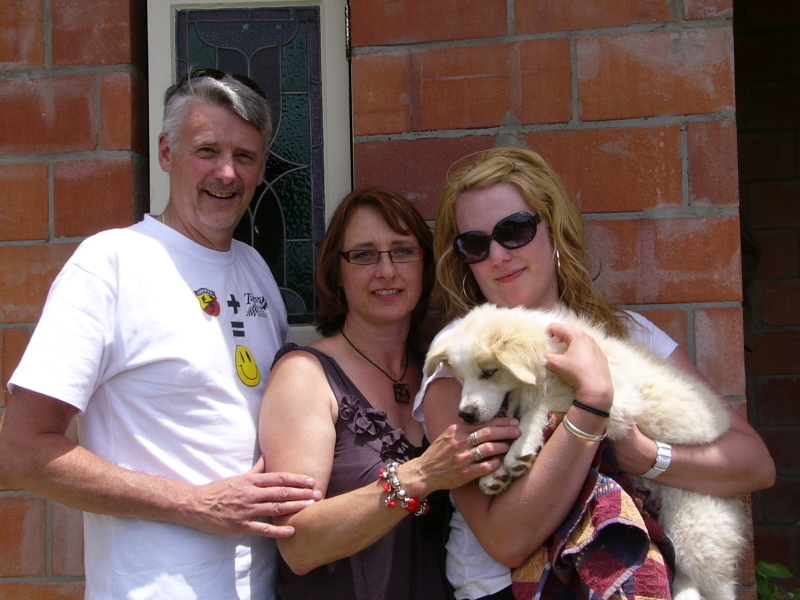 Monique & Mike came early in the new year & daughter Melissa & went home with young Osca. We have quite a few photos & emails & I’d say they are pretty smitten with the young man. They lost their border collie not so long ago & Osca is doing his best to make them feel good again by the sounds of things. Thanks for all your pics I do love them & hearing his news… Look forward to seeing you next time I’m in Vegas!! 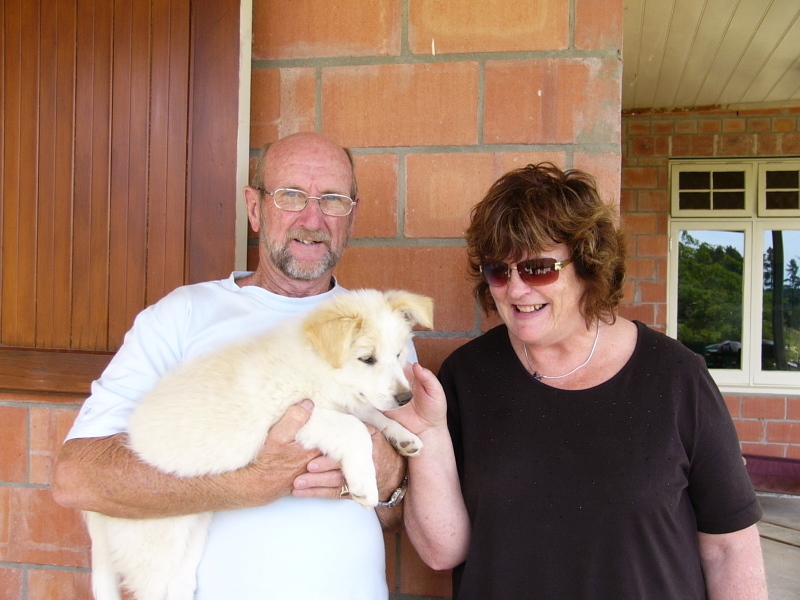 Diane & Maurice also lost their dog not so long ago & Zac is there to keep them on their toes. He has moved in with cats who I’ve been told keep him on his toes so all good there too!!! We still have one darling little gal to home. The kids have named her Harley. She is a sweetie.. Quite independant, she has free access to the house but at night she prefers to sleep oustside. On our walks she looks back at me & so much reminds me of her grandmother Jessie. I will miss her when she goes and she’ll make a lovely pet to someone. The other 2 little rascals.. well they are going to live here forever and a day. 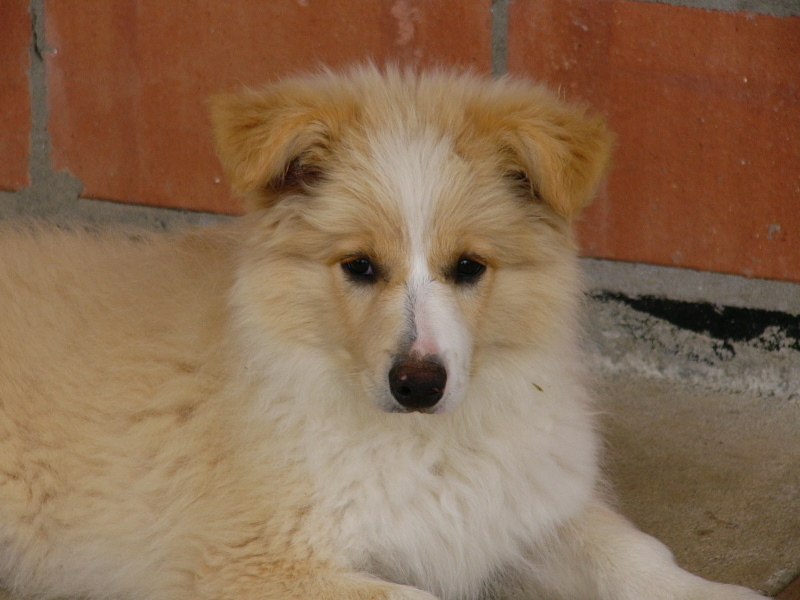 Tyler & Jasper were my first litter mates & I have always wanted litter mates again. This wasn’t the plan originally as Maddie normally throws more boys but we decided the time was right as Tyler & Hoons are now 9. We are keeping 2 young ladies & have named them Shiraz as she is a dark smooth red & Moet who is a light colour with lots of bubbles!!! Love them to bits already!!! They remind me of Tyler & Hoons so much. Certainly with the 3 pups here- who I will have to say have moved into the house, it can get a little chaotic but its all good!!! 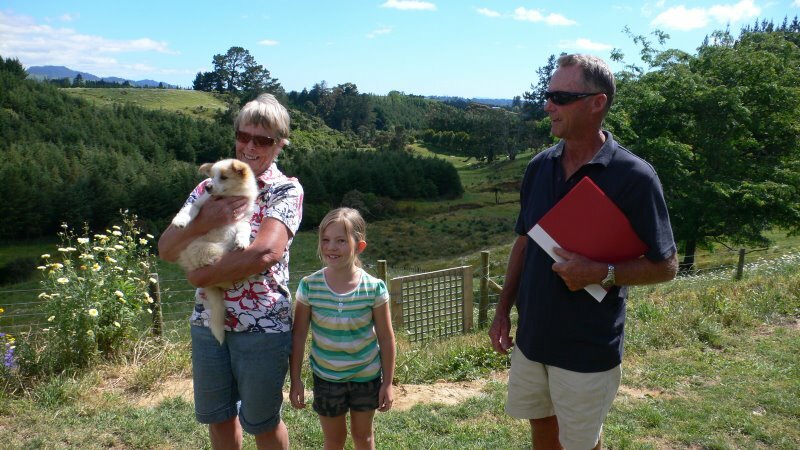 And I also have a family who sadly have to re-home their red girl Phinn down in the Wairarapa – Carterton area. I have just been sent some fab pics of her & she really needs a very special loving home. She’s 4 1/2 & is Tyler/ Bruce pup and is spayed. Please email or phone me so I can put you in contact with the owners. I have added one pic of her. 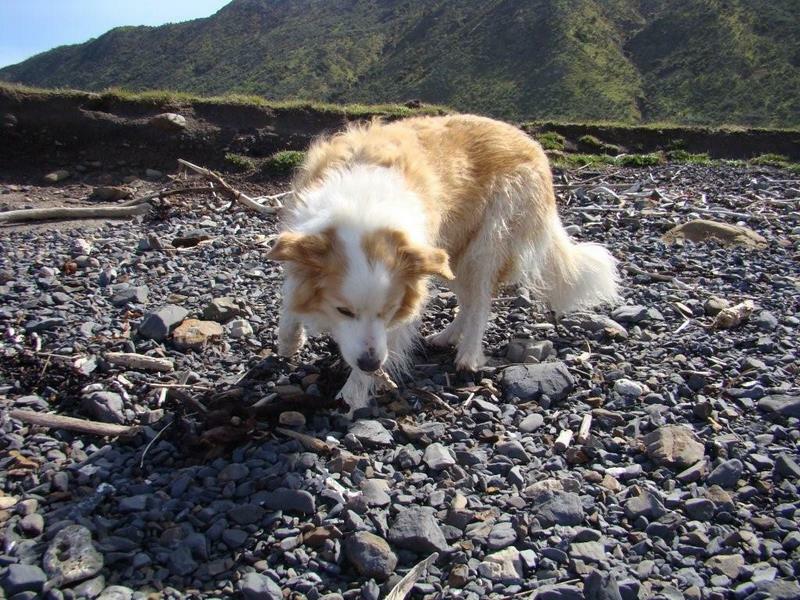 I will be down Turangi way mid March so if she hasn’t found a home by then I will bring her back home with us if that helps. Anyway that is about enough ramble from me.. next update will be more pics of liddle Charlie’s mob & maybe my two new kids on the block..